The zipper I ordered from Zipper Source arrived and I hurried to sew it into my Glory Days jacket so that I might be able to wear it before the summer heat hits. I ordered a #5 Molded Plastic But-To-Length 18" zipper, medium length with an open end and autolock tab in Bordeaux. 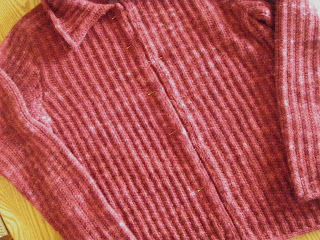 I took photos as I inserted the zipper (I apologize for their poor quality) to demonstrate how easy it is to add a zipper to handknits. First, pin the zipper in place. 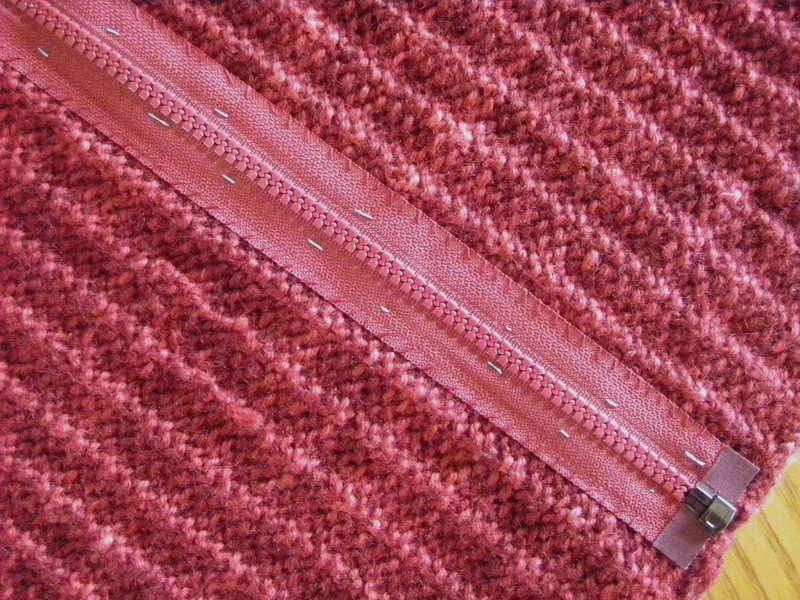 I pinned it so that the I-cord edging met along the zipper teeth. 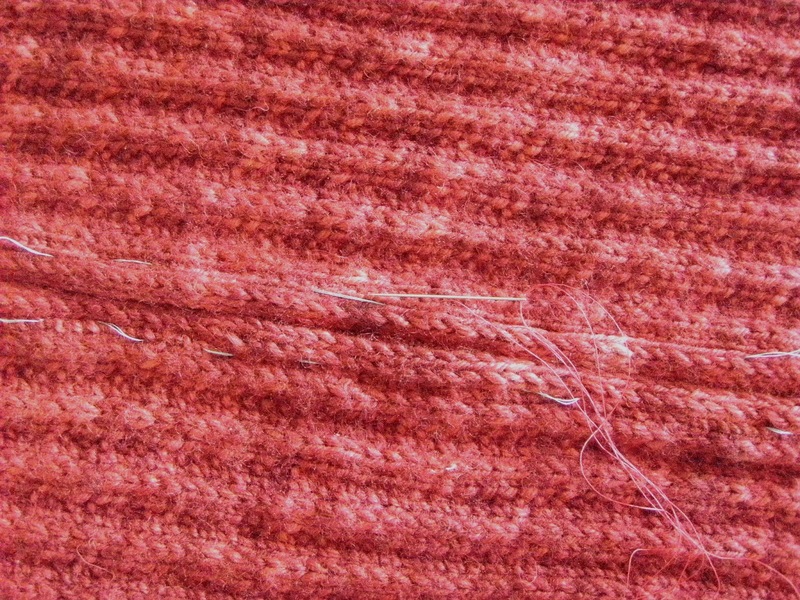 Next, use a contrasting yarn to baste each side, removing pins as you go. The turquoise thread I used looks white in this photo. Here's how the basted zipper looks from the wrong size. 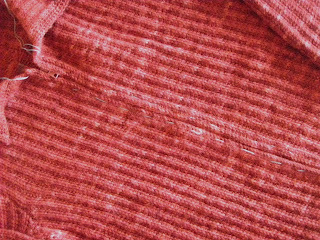 Next, use small stitches with coordinating thread to sew the edges of the zipper tape to the wrong side of the garment. 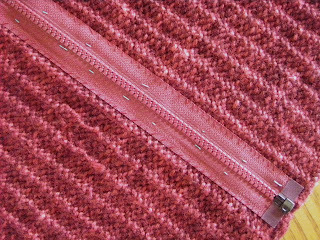 Finally, work backstitches with coordinating thread to sew the right side of the garment close to the zipper teeth. You can hardly see the needle in this photo. I'm following a column of stitches along the garment side of the I-cord edging. Remove the basting and you're done! 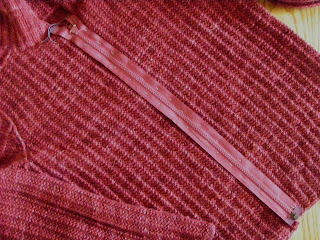 My backstitches didn't follow a very straight line, but they hold the zipper firmly in place. I'll soaked the jacket again to block the collar and set the zipper stitches, and it will be ready to wear! It's official -- Not only will I be attending, but I'll be teaching this fall at the New York Sheep and Wool Festival in Rhinebeck, NY, Thursday, October 17 through Sunday, October 20. For more information on all the classes, go to http://www.sheepandwool.com/workshops. After my washed, blocked, and dried swatch hung with weights for a day, the gauge measures 27 stitches and 39 rounds = 4". That translates to 6.75 stitches and 9.75 rounds = 1". The gauge for the sweater is listed at 6 sts/inch (page 93 of The Knitter's Handy Book of Top-Down Sweaters). I like the density of my swatch and wouldn't want to change to larger needles (and a looser fabric) to match that in the pattern. Instead, I want to see if I can follow the instructions for a larger size and end up with the size I want. I'd like a bust circumference of 40", which means I need 40" x 6.75 sts/in = 270 stitches just below the armhole. The total number of body stitches are given on page 96, at the end of the heading "Divide for Body and Sleeves. The largest size has 276 stitches, which would translate to a bust circumference of 40.9" at my gauge. The second-to-largest size has 252 stitches, which would translate to a bust circumference of 37.3". Neither of these is exactly what I want, but the largest size is closest. I've decided to follow the instructions for the largest size for all stitch counts, but because I'd rather err on the smaller size, I think I'll omit the last raglan increase so that I'll end up with 268 stitches for the body. That will give a bust circumference of 39.7". I'll count rows rather than simply measure vertical distances to make sure that the lengths will reflect the after-hanging row gauge. It's time to cast on! 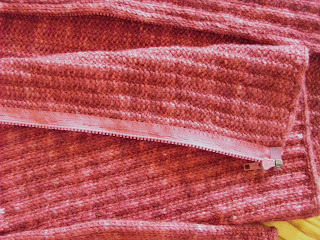 During the recent snow, I consoled myself by knitting a swatch for the Weekday Raglan (page 92 of The Knitter's Handy Book of Top-Down Sweaters) that I plan to knit for myself. 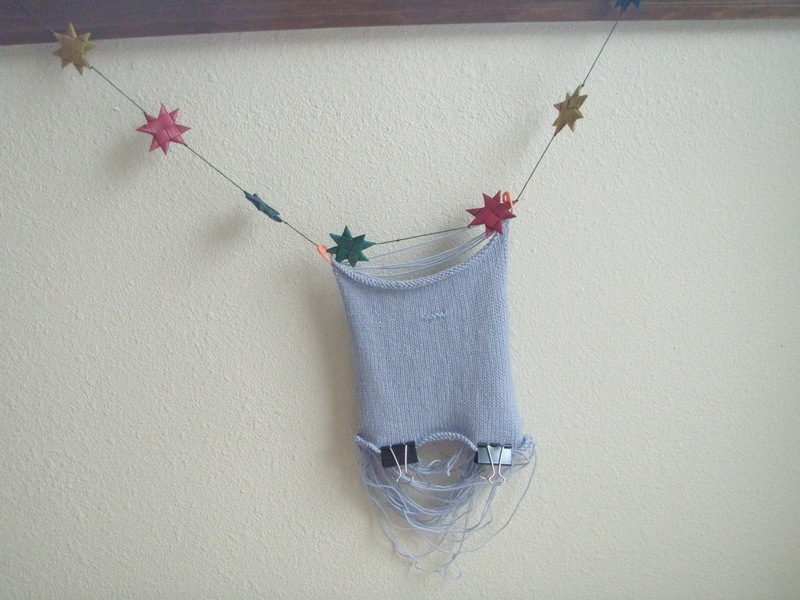 The sample sweater for the book is much too small for me so I'll be following instructions for a larger size. 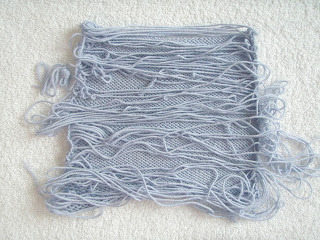 For my version, I've chosen Grignasco Champagne (75% extra fine merino, 25% mulberry silk; 165 meters/50 grams) in a soft periwinkle color (#375) knitted on size US 5 (3.75 mm) needles. 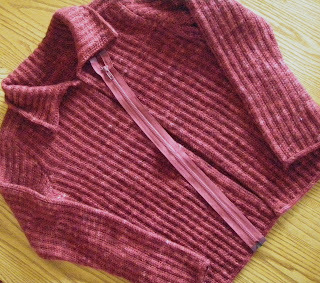 Because I'll knit the sweater in rounds, I worked my gauge swatch like a giant I-cord, knitting across the stitches, then sliding them back to the needle tip, bringing the yarn loosely around the back, and knitting the stitches again. In this way, every stitch is knitted on every row, just as when knitting in rounds. 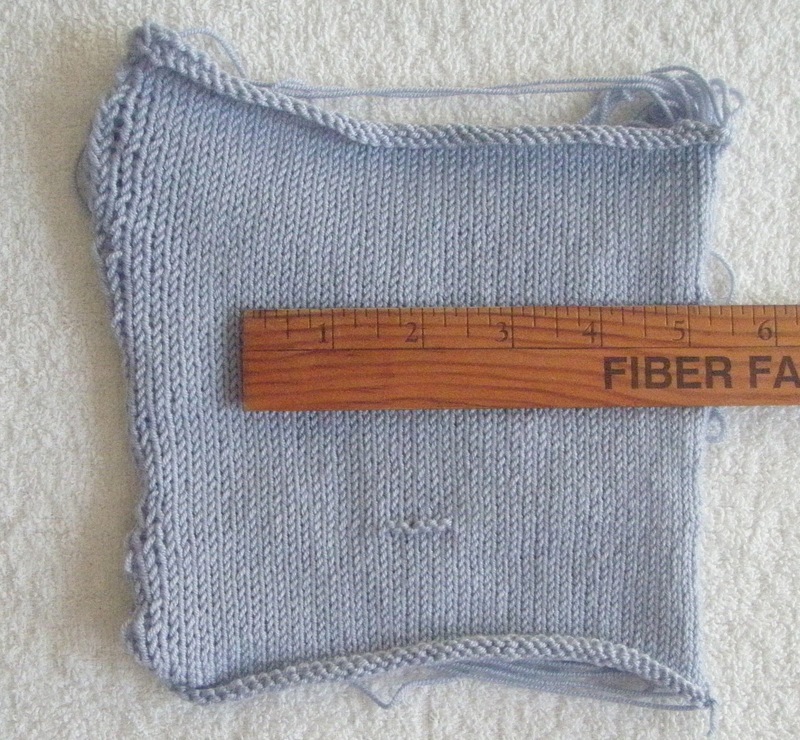 After washing and blocking, my gauge changed to 26 stitches and 38 rows = 4". Don't ask me how the stitch gauge can vary while the row gauge stays the same. 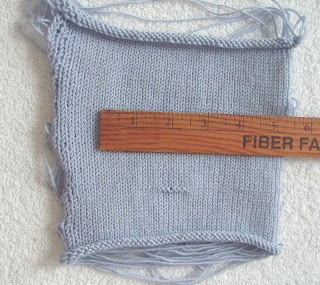 I'll measure the stitch and row gauge tomorrow to see if there is what's called a "hang gauge" that might affect the finished size of the sweater. 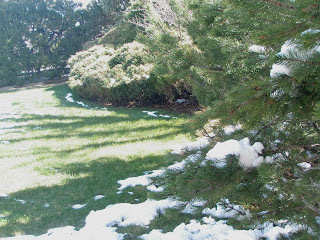 My fingers are crossed, but I think the snow here is melting for good. Just look at all that lovely green! We normally face water restrictions during the summers due to our arid climate. But we've gotten nearly 10.5 feet of snow this winter (and 5 feet in the past 4 weeks! ), so it looks as though there'll be no restrictions this year. But better yet, the wildfire danger is minimal as we approach the one-year anniversary of the worst wildfire season on record. What a relief! 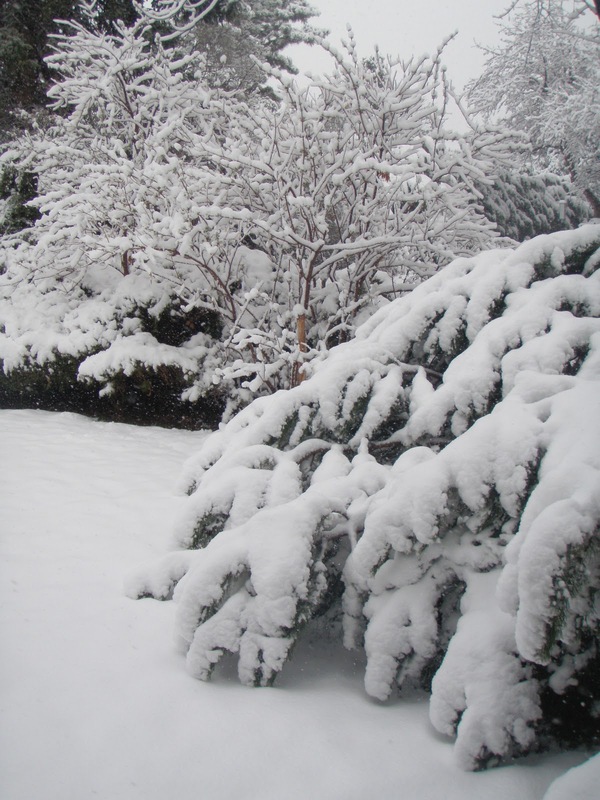 We had the snowiest April on record -- four feet of the cold white stuff in fewer than four weeks. 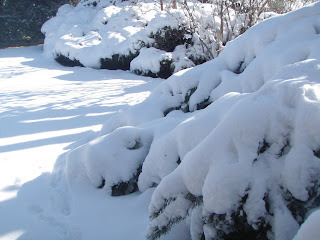 The temps finally became seasonal over the weekend and I thought that we were done with winter for good. Imagine my surprise when I looked out the window this morning. That's another 6" of snow, and it keeps coming down! Thankfully, the forecast is for sunny skies and temps into the 40s and 50s for the rest of the week. Still, I don't suppose it's safe to put away my heavy sweaters just yet.